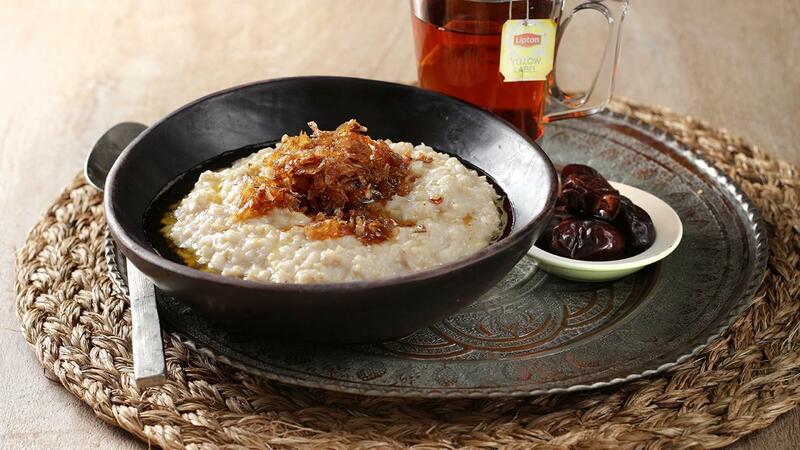 This is traditional dish in the kingdom of Saudi Arabia and the perfect dish to have for Sahoor, very filling and full of energy to help your guests cope with the day of fasting ahead. Wash the rice and Jareesh till water is clear. Heat oil in a large pot, cook the onions till soft, add the rice and Jareesh and coat in the hot oil. Add the cinnamon and water then dissolve in the Knorr Chicken Cubes. Cover with a lid and let it cook till all water is absorbed about 2 hours it will give you time to work on the all-important garnishwhich is essential to this recipe. Once the Jareesh has cooked stir in the yogurt, this is no easy task, you could use a cake mixer with a whisk attachment to make it easy, just don’t overdo it a few seconds is enough. Heat the ghee over a low flame add the onion and stir every few minutes cook till caramelized. Be patient and don’t turn up the heat, the onions will burn. Add the spices and toast for a few minutes, turn of the heat and stir in the Knorr Lime Seasoning Powder. Plate the Jareesh and pour over the caramelized onions. Serve with a hot cup of Lipton Yellow Label Tea.